and transform your sales and career! Driving the effectiveness of a sales team is a lot more than sending them on a course. It takes a professional to be able to look at all facets of the sales organisation, spot where the strengths and development areas are, and rebuild it – often from the inside out! Not only that, as a person responsible for developing the sales team, you must be at the forefront of the latest methods, techniques and tools that will give your team the competitive advantage to win. 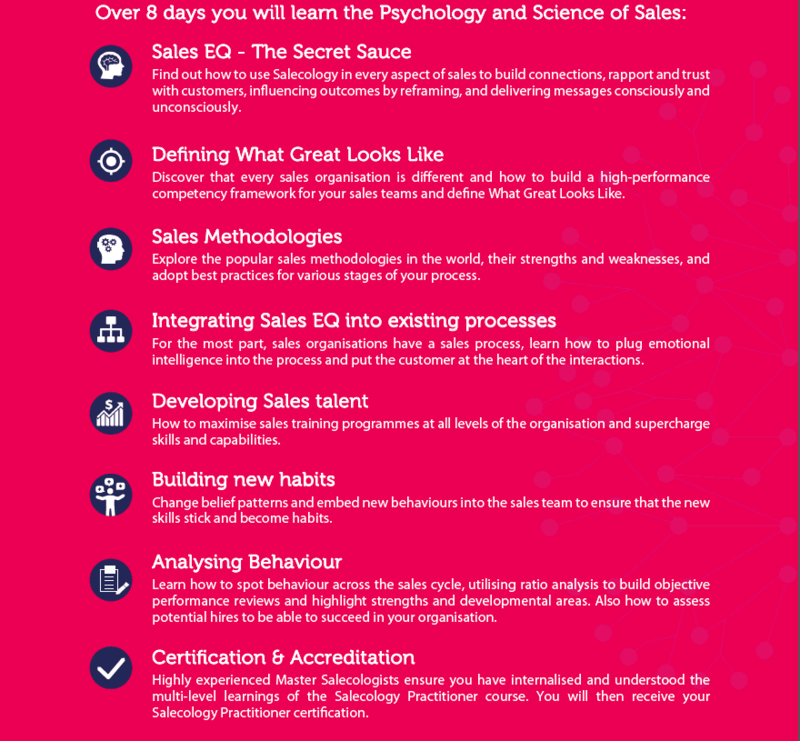 Salecology is the only sales science that combines all facets of psychology including; brain activity, personality, behaviour and social factors, applying it all to the sales world. Using the latest research in neuroscience, we provide you with a unique set of skills to be able to strengthen immature sales methodologies and behaviours, enhancing them with Emotional Intelligence (EQ) across every stage of the sales cycle, and delivering significant improvement on sales engagements and performance. "Salecology know how to turn good sales people into great sales people - resulting in a deeper understanding of customers and their needs"
Salecology has already transformed companies and people’s lives in 33 countries worldwide. Watch the online video to find out how to become a qualified Sales Psychologist or click below to chat with one of our Salecologists.